We all want some part of us to live on–to be remembered for what we did. But will we do if it means being ourselves 100% of the time? I first heard of David Bowie via The Artemis Fowl Files by Eoin Colfer​, an interquel between the first and second books in the series. At the time, the Artemis Fowl series was the hottest thing within my preteen interest radius, and I discovered that the titular protagonist’s favorite song was David Bowie’s “It’s No Game, Part 2” from the Scary Monsters album. And so, being a fangirl, I had to listen to the song. I found it on YouTube, listened to it, and enjoyed it a lot. And then I never listened to it again. Fast forward a few years later, and I find “It’s No Game, Part 1” thinking it’s part 2. And I listen to it. And the Japanese-language-and-culture-loving part of me went crazy. He brought a woman on to speak the lyrics translated in Japanese and made it even cooler. I gained immense respect for him. And then, like before, I went on to do something else, and never listened to it again. Fast forward to today, 2016, where I’m scrolling my Facebook feed, and I learn that after an 18-month battle with cancer, David Bowie is no longer of this earth. My face contorts into a frown. My chest lightens, then smacks the ground like a deflated basketball. I can’t believe he’s gone, I think. I’ve only listened to two of his songs. I need to listen to more! And then, another thought: Wow. It’s only when he’s dead and trending on my Facebook page that I give another thought about him. And yes. That thought is mean, and true. I don’t think about David Bowie, Natalie Cole, Eoin Colfer, Oprah Winfrey, or any other celebrity that I respect all the time. I’ve got my novel to work on–my life to live. But in the era of YouTube, where music has become more accessible than ever, single songs are also accessible rather than entire albums. In the era of fast-paced networking and social media distractions, I can listen to a single song on YouTube and not feel guilty about it until it’s too late–until the day that artist dies. Before YouTube, before easy access to music via the Internet, I would go to my dad’s room, take any CD I wanted off his shelves, pop it into my boombox, and let it rip. I could listen to all the songs on an album and decide which ones I liked. If I liked it a lot, I could get another album from my dad’s collection and start the whole process again. I got a much better picture of the artist by listening to ten or more songs rather than just one. Therefore, I encourage all of you reading that from now on, follow what you like. Don’t stop at one song, one book, one poem, one painting from an artist. Don’t even stop if the artist just has one thing they’ve created. If an artist makes something else, look at it. Learn about them. There might be something else you enjoy and get inspired by. As I write this post, I’m listening to the entire “Scary Monsters” album where both parts of “It’s No Game” are from, and what really makes me feel bad about my bare bones on-and-off listening with David Bowie is both parts of “It’s No Game” are the first and last songs of the album. I completely skipped over wonderful songs like “Ashes to Ashes” and “Fashion,” all because I decided some years ago, on two separate occasions, that I had something better to do than listen to a few more of his songs. It’s unrealistic and distasteful of me to worship David Bowie now that he’s gone. I would be disrespecting those who have actually taken the time to get to know him and his music. David Bowie is not the kind of music I listen to on a regular basis, so it is new and different for me on some levels. And for some of his songs, I just don’t take to them. But I like new and different. I am allowed to be curious as to what made Bowie such an icon for so many people by listening to his music and watching the films that he starred in. There is a reason one of my favorite authors decided that his protagonist’s favorite song was by David Bowie. People of the creative arts, I believe, have good taste. And I’m not just saying that because I am artist myself. Artists are known to be highly sensitive individuals. Which brings me to an important point: I am an artist, and there is possibly someone else you know in your life that’s an artist. And chances are, they will remember you just as you remember them. While I can’t speak up for artists everywhere, I think I can speak to that small part of human desire inside all of us that wants to be remembered. Artists have a distinct advantage in that department because they leave their work behind. Yet it isn’t enough for an artist to leave their work behind. They have to touch lives in some manner, and their ability to touch lives means nothing if we aren’t willing to be touched in return. In other words, when artists are 100% themselves, we should be 100% ourselves with them. Don’t be like the kid I was years ago, listening to only one song off an album and calling it quits. Take that part of you, and run with it. In fact, I’ll give you a head start. The Scary Monsters album is linked below. Have a listen. You just might like something you hear and be connected to yourself in a new way. And if you don’t care for it, that’s cool, too. Because you’ve figured out what you like and don’t. You know yourself. David Bowie knew himself, too, and I think that’s what made him so famous. Thank you, YouTube users, who put up his music for me to listen to. Thank you, Eoin Colfer, for exposing me to a pretty wicked artist. 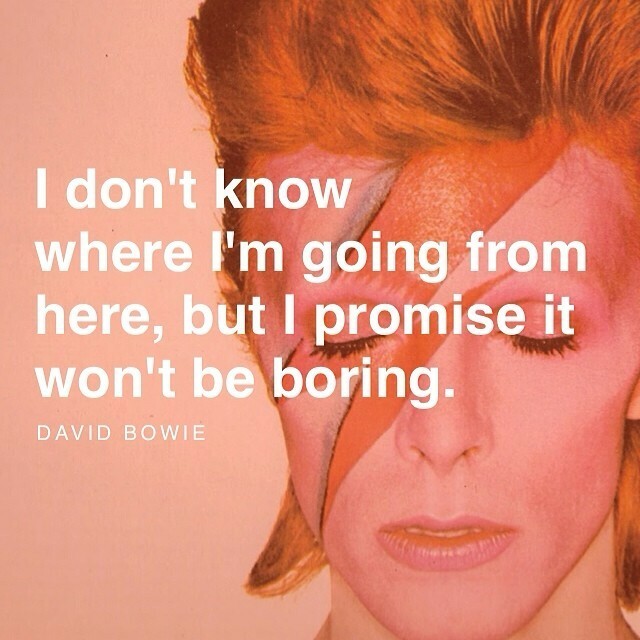 And thank you, David Bowie, for just being you.